Fate: Sold for scrap 21 August 1947 and broken up in December that year by Arnott Young, Dalmuir. HMS Hawkins was a Hawkins-class heavy cruiser of the Royal Navy. She was built at Chatham Dockyard and launched on 1 October 1917. With the conversion of her sister, Cavendish, to become the aircraft carrier HMS Vindictive (1918), Hawkins became the name ship of her class. Hawkins was commissioned on 25 July 1919 and became the flagship of the 5th Light Cruiser Squadron on the China Station. She spent less than a decade in active service before being paid off at Chatham to undergo a refit. During this refit, her coal-fired boilers were removed and the remaining oil-fired boilers modified. She recommissioned in December 1929, and became the flagship of the 2nd Cruiser Squadron as part of the Atlantic Fleet. Hawkins was decommissioned again in May 1930 and reduced to the Reserve Fleet. She was recommissioned again in 1932 to become the Flagship of the 4th Cruiser Squadron in the East Indies, before again being reduced to the reserve in April 1935. The terms of the London Naval Treaty meant that in 1937, Hawkins was demilitarised and had all her 7.5 inch guns and the deck mounted torpedo tubes removed before she was again returned to reserve status. In September 1938 plans were drawn up to utilise Hawkins as a Cadets' Training Ship. 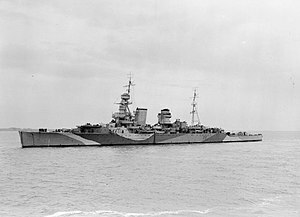 When the Second World War broke out in 1939, Hawkins was rearmed and recommissioned to become the flagship of Rear Admiral Henry Harwood, after the Battle of the River Plate. She patrolled off the South American coast, operating as far south as the Falklands. She left Montevideo on 5 September 1940 to sail to Simon's Town, South Africa for a refit. Before she could make use of the dry dock, it was occupied by the aircraft carrier Hermes, which was undergoing repairs after having been damaged in a collision with a merchant ship. Hawkins was diverted to Durban where she spent seven weeks waiting before she was able to dock in the Selborne dry dock at Simonstown. Hawkins also rescued nine of the crew from the tanker British Premier, which had been torpedoed off Freetown by the German submarine U-65. During February 1941 Hawkins was active off the East coast of Africa, supporting the British reconquest of British Somaliland and subsequent pushes into Italian Somaliland from Kenya as part of Force T of the East Indies Fleet. She also captured a number of Italian and German merchant ships attempting to escape the fall of the former Italian territory, including Savoia. She later provided escorts for convoys and intercepted Vichy French and neutral shipping. Whilst off Mauritius her starboard outboard shaft fractured and she lost her screw and shafting. She spent the period between 10 October to 28 October in the Selborne dry dock, before departing on 2 November to refit and repair in the UK. The repairs were completed by May 1942 and Hawkins left to join the Eastern Fleet, and again escorted ships around the African coast, with periods in drydock for repairs and refits. One of the ships she escorted was Khedive Ismail, later torpedoed by a Japanese submarine with heavy loss of life. In June 1944 she returned to British waters, where she was involved in Operation Neptune, as part of the Western Task Force Gunfire Support Bombardment Force A, for Utah Beach. Before this, she had been involved in Exercise Tiger, a disastrous attempt to rehearse the landings. In August she was again designated as a Training Ship. In 1945 Hawkins was reduced to reserve for the last time. In January 1947 she was allocated for ship target trials, and was bombed by Royal Air Force Avro Lincoln bombers off Spithead. She was sold for scrap on 21 August 1947 and broken up in December that year at the yards of Arnott Young at Dalmuir. ^ "Lloyd Triestino / Società di Navigazione Lloyd Triestino / Società Anonima di Navigazione Lloyd Triestino / (from 1936) Lloyd Triestino di Navigazione SpA". The Ships List. Archived from the original on 1 May 2010. Retrieved 11 January 2009. Gardiner, Robert (ed.). Conway's All the World's Fighting Ships, 1922-1946. Naval Institute Press. ISBN 0-87021-913-8. Lenton, H. T. British and Empire Warships of the Second World War. Greenhill Books. ISBN 1-85367-277-7. Whitley, M. J. (1995). Cruisers of World War Two. Great Britain: Brockhampton Press. ISBN 1-86019-874-0. Jane's Fighting Ships of World War One. Jane's Publishing Company. 1919. Wikimedia Commons has media related to HMS Hawkins (D86). This page was last edited on 12 July 2018, at 03:38 (UTC).